In the early times, when the people of Israel dwelt in their own land, judges, prophets, and high priests ruled instead of kings and princes. One of these high priests was Eli, a man who loved the Lord, though he did not watch over his wicked sons as he should have done. Eli lived near the tabernacle, or, (as it was then called), the temple. This temple was a large place, perhaps made of boards, with beautiful curtains inside, where the worship of God was carried on. In it were the holy place and the holy of holies, the ark of the covenant and the mercy seat, the altar of incense, the seven-branched golden candlestick, and other sacred things. 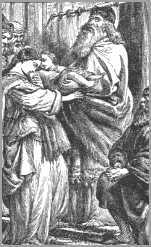 One day there came to the temple a good woman named Hannah, with Samuel, her little child. She had often been to this place before. Once when she came there she had prayed to the Lord to give her a son. And now she had brought this son with her, to offer him to the Lord, that he might be His servant in the temple. She had given to him the name of Samuel, which word means — "asked of the Lord." Hannah had made a vow, or promise, that if she had a son he should be given to the service of the temple. A great many of us are ready to make all sorts of promises to God when we are in trouble or want something, but do we always keep our promises? Too often when trouble is over we forget them. The child was young, perhaps only three years old, when he first stood before Eli. "For this child I prayed," she said; "and the LORD hath given me my petition which I asked of Him: Therefore also I have lent him to the LORD; as long as he liveth he shall be lent to the LORD." Then little Samuel began to "worship the LORD there." We may suppose that the mother fondly kissed her dear child before she left him in the temple, and then went to her happy home. Samuel now wore a linen ephod. The ephod was part of the dress of a priest. It was a robe which hung down in front, and over the back. It was fastened by buckles set with jewels on the shoulders, and round the body by a girdle or sash. These buckles were often made of gold, and were set with sparkling jewels. Every year Hannah made a little coat, and when she went up with her husband to the house of God to offer the yearly sacrifice, she took it to Samuel. Jewish mothers used to employ some of their time at home in weaving wool and flax into cloth. This custom is noticed in the thirty-first chapter of Proverbs. They sat at the doors of their houses, and as they turned the distaff, or little machine for spinning, they sang some of the songs of Zion. We may suppose that Hannah spent many happy hours weaving the coat for her little boy, and longed for the time when she might take it to him, and again give him a mother's kiss. It may have been of fine linen — if so, it was made of flax; or of the purest white wool, which kind was much worn by the Jews; or it may have been of many colors, like that given to Joseph by his father Jacob. But whichever it was, it no doubt was a source of joy to both mother and child. We think we see the delight of little Samuel whenever be saw his mother, and received from her hand his new coat. Some children would have become proud or vain if they bad been dressed as Samuel was; but we do not think he was vain of his robe, or of his early service in the temple. He was an obedient and pious child, for it is said of him, he was "in favour both with the LORD, and also with men." Day by day the faithful child did his work in the temple. It seems to have been part of his duty to see that the seven lights on the great golden candlestick were burning, and to open and shut the doors. They were simple duties, you may think, but in doing them properly, little Samuel was pleasing God as much as the king on his throne, or the general at the head of his army. It does not matter what our day's work may be, but it does matter how we do it. The Bible tells us, "Whether therefore ye eat, or drink, or whatsoever ye do, do all to the glory of God" 1 Corinthians 10:31 and "do it heartily, as to the Lord, and not unto men." Colossians 3:23. "Here am I, for thou calledst me." Eli said, "I called not; lie down again." It was not long before he again heard the voice saying, "Samuel." He was now sure it was Eli, and he quickly went to his bedside, and said that he had indeed heard him call. "I called not, my son," was the reply; "lie down again." It was the voice of God that spoke, though as yet Samuel did not know it. A third time the voice called as before, and the boy again hasted to his master. Eli now understood that it was the Lord who had spoken. "Go," said he, "lie down; and it shall be, if He call thee, that thou shalt say, Speak, LORD, for thy servant heareth." So Samuel went and lay down in his place. For the fourth time the voice cried, "Samuel, Samuel." The lad now spoke as he had been instructed by Eli. Then the voice gave him this message for the aged Eli, that the Lord would punish the people of Israel for their sins, and that Eli's two sons should both die in one day, because they were very wicked. He was also to declare that the Lord was angry with Eli for not doing all he should have done to keep his sons from their evil conduct. When the morning came, Samuel began to attend to his duties in the temple. He was afraid to tell Eli the sad things that would come upon his family and people. While he was there, Eli called him, and asked what the Lord had said, and desired that he would not conceal any word from him. When Eli heard what would come to pass, he piously said: "It is the LORD: let Him do what seemeth Him good." Soon after this time the sons were killed in battle; and when their aged father was told they were dead, and that the ark of God was taken, he fell down from his seat and died also. Samuel grew up to be the prophet and ruler of his people; and, after a useful and holy life, he died at a very old age. Because of his good life and labors we are told that at his death, "all Israel ... lamented him." 1. No audible voice is now heard such as came to Samuel in the temple; yet God speaks to the young by the voice of pious parents, by teachers and ministers, by His Word, and His Holy Spirit in their hearts. In this way He has spoken many times to you. 2. Ask for grace that you may devote yourself to the Lord Jesus Christ. He invites the young to give their hearts to Him. Why do they not attend to Him? Because they do not know how much He loves them. They do not feel how much they need Him as a Saviour. They do not think how greatly He can bless them, and do them good. 3. If the young would be useful when they grow up, they should try to be useful when they are young. They are not called to do the work which Samuel did in the Temple; but there are many ways in which they can serve God and obey His Word, and do good in the world.